Senate Majority Leader Bob Duff, D-Norwalk, at microphones, flanked by Sen. Cathy Osten, D-Sprague, and Sen. Tim Larson, D-East Hartford. A proposal to expand casino gaming outside of Connecticut’s Indian reservations advanced Thursday. But while the state legislature’s Public Safety and Security Committee endorsed the measure by a wide margin, it narrowly rejected an amendment that would have barred the state from offering loans, grants or other economic aid to preserve casino jobs. The Democrat-controlled panel voted 15-8 to adopt the measure with bipartisan support. It now heads to the Senate, though it likely will be referred from there to other committees. If enacted, the bill would allow the Mashantucket Pequot and Mohegan tribes – which operate the Foxwoods Resorts Casinos and Mohegan Sun casino, respectively – jointly to open up to three gaming parlors to compete with new casinos recently opened, or under development, in Massachusetts, Rhode Island and New York. “This is a huge industry for us in the state of Connecticut,” Sen. Tim Larson, D-East Hartford, co-chairman of the committee said, adding that each new gaming facility means not only thousands of construction and service jobs, but a big boost to the state’s tourism industry. “Believe it or not we are a destination,” he said. The tribes’ initial plans only involve one gaming facility, to be opened in north-central Connecticut. Its goal would be to attract patrons who otherwise might visit a new $800 million casino being developed in Springfield, Mass., by MGM Resorts International. “As long as it’s going to create some jobs in the state of Connecticut, I’m for it,” said Sen. Edwin Gomes, D-Bridgeport, who said he hopes the tribes will open a small gaming facility in his home community. Mashantucket Pequot Tribal Chairman Rodney Butler and Mohegan Tribal Chairman Kevin Brown thanked lawmakers in a joint statement after the meeting. Rep Craig Miner, R-Litchfield, tried to amend the bill Thursday to bar Connecticut from offering any economic assistance to the venture. “This notion that somehow chasing booze and gaming is somehow going to bring (state finances) out of the hole is shocking,” Miner said. Even tribal representatives have said their proposal is designed to mitigate — and not to reverse — a trend that has seen the state’s gaming industry contract over the last seven years in the face of increased out-of-state competition. 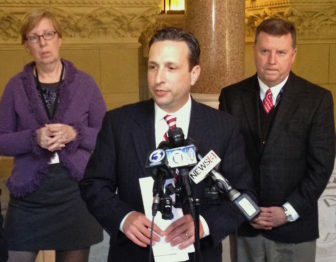 Rep. Daniel Rovero, D-Killingly, called Miner’s proposal “a great amendment” and said that unlike other state assistance – such as the tax incentives provided last year to United Technologies to bolster Connecticut’s aerospace industry – aid to casinos would be counter-productive. “When we’re talking about betting and casinos, we’re talking about people who have bad habits,” he said. But Rep. David Kiner, D-Enfield, said Connecticut should not rule out the prospect of future assistance to an industry that employs thousands of people. “You just don’t know what’s going to happen down the line,” he said.